June’s monthly sales total for 2011 American Silver Eagle bullion coins hit two milestones in the .999 fine silver series. 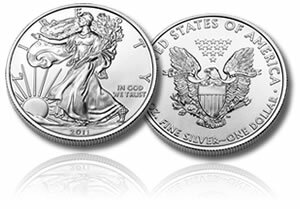 The United States Mint sold a total of 3,402,000 Silver Eagles to their network of Authorized Purchasers for the month. The sales figure earned the title of the best ever June and ranked 7th place in all-time monthly sales. June 2011 snuck ahead of the previous June record set last year by 401,000 or 13.3%. June 2010’s total was 3,001,000. Gains such as this have nearly been routine this year. The only month in 2011 that did not outperform its corresponding month in 2010 was March, which was 2,767,000 versus 3,381,000. Comparing June to May this year, however, shows a slight slowdown in sales. June was 251,500 lower than May’s impressive 3,653,500 total, but June still came in third place for 2011. Holding the top spot is January. In top ten Silver Eagle monthly sales, nine have been set within the last two years. The table below illustrates. Most of the months shown in the above table came during a time when the United States Mint limited how many Silver Eagle bullion coins it sold, as was the case last month. To help increase future supplies, the Mint began fulfilling bullion orders with San Francisco minted Eagles on May 31, in addition to coins produced at West Point. In the year to date total, Eagle sales ended at 22,303,500 on June 30. If the second half of 2011 performs as well for the coins, the annual total would top 44.6 million. The annual record was set last year at 34,662,500. Part of the driving force for the American Silver Eagle bullion coin is obviously the direction of the precious metals market. 2011 experienced several bouts of 31-year highs, especially during the month of April. Since then the market has settled into the $30 to $40 per ounce range. Some of the dips in prices have provided buying opportunities, based on how Silver Eagle sales tend to surge. Friday’s closing price in New York came to $36.54 an ounce, or about double the level from a year ago. As a side note, the Silver Eagle bullion coin now has a touch of competition with the release of the collector proof version on June 30. Their sales were solid over the first six days with buyers ordering 367,623. Unlike the bullion coin intended for investors, the proof Silver Eagle has the special mirror-like finish, carries a West Point "W" mint mark, and is sold direct by the Mint to the public. The public must purchase the bullion coin through the secondary market, as the Mint only distributes them through its small group of Authorized Purchasers.